Pediatric Injectable Drugs, also known as “The Teddy Bear Book,” is one of the ASHP’s most recognized and trusted resources dedicated to helping pharmacists treat pediatric patients with injectable drugs. For more than 20 years, pharmacists and hospital pediatric teams have looked to Pediatric Injectable Drugs (The Teddy Bear Book) for the most comprehensive research-based information on pediatric intravenous infusions. Now for the first time since 2013, a new edition of this trusted resource is available! 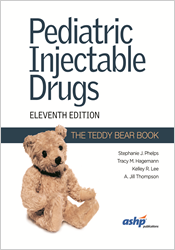 The “Teddy Bear Book”, is the only reference of its kind that focuses on the unique issues that pediatric practitioners face when dealing with pediatric injectable drugs, such as limited fluid amounts, limited intravenous sites, and maximum doses. The updated edition of this comprehensive resource by respected editors Stephanie J. Phelps, PharmD, BCPS, Kelley R. Lee, PharmD, Amanda Jill Thompson, PharmD, and Tracy M. Hagemann, PharmD, FCCP, includes 15 new monographs and updates based on the latest evidence-backed literature.